After freezing non-union wages for 3-1/2 years, TriMet increased non-union wages last July by an average of 3 percent. The increase totaled just $910,000, less than 1 percent of the $473 million operating budget. The claim that that there was an attempt to hide the raises from the public is false. We provided the information to the Board of Directors, the General Manager’s Budget Task Force and the transit advocacy group OPAL. However, the salary increase should have been discussed publicly, and we will be more transparent going forward. We are committed to continuous improvement and know that we can always do better, and will. As some media and riders continue to raise the issue, TriMet General Manager Neil McFarlane sets the record straight. McFarlane said there’s more to TriMet’s salary story. In addition to deferring wage increases for 3 ½ years, TriMet reduced health care benefits for non-union employees and reformed retirement compensation that has saved the agency millions of dollars. The agency has also controlled costs by managing the size of its administrative staff. Over the past two recessions, we cut roughly 200 positions, including 11% of our administrative staff. These changes, which amounted to cuts in compensation for our administrative employees, helped us control costs during the recession and avoid more severe cuts to service. At the same time, union wages increased 3% per year. There are 2,109 union employees and only 427 non-union employees. The 49 non-union employees making more than $100,000 funded through the General Fund makes for a provocative headline, but it doesn’t tell the whole story. These employees range from the General Manager and executive team to computer programmers and other professionals. In fact, TriMet has fewer employees now than seven years ago when adjusted for inflation. 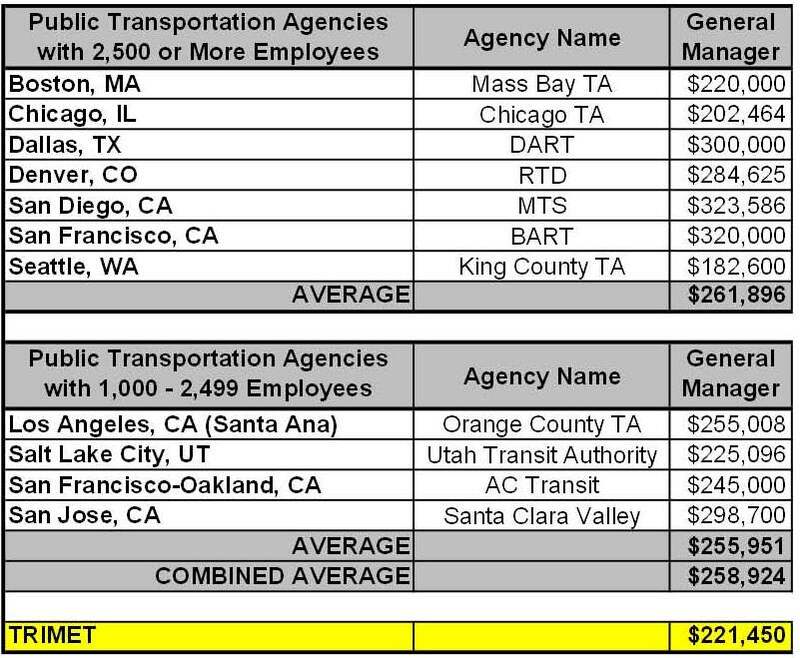 Regarding McFarlane’s General Manager salary, which is set by the Board of Directors, it’s below the average of other peer transit agencies. 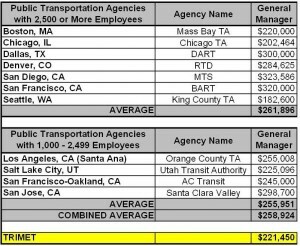 He makes $221,450, and according to the American Public Transportation Association (a national trade organization), the average GM salary for agencies with over 2,500 employees is $263,310 (TriMet has 2,536 employees.) See comparison chart. We also outperform our peers in nearly every category. This includes delivering more transit service with lower overhead costs and having higher ridership per capita. View the full report. The main driver of our budget challenges are not salaries, but skyrocketing health care costs that continue into retirement. TriMet pays about $30,000 a year for a union family benefits through the PPO Blue Cross/Blue Shield plan. With no further contract reform, TriMet is on track to pay nearly 50 percent of its base payroll taxes for health care benefits for active and retirees. In 2003, TriMet required non-union employees to share in the cost of their health care benefits and have since moved to an 80/20 co-insurance plan that has saved the agency millions. We’re offering the same fair health care benefit to our ATU union employees. The savings from this modest change will allow TriMet to put bus service back on the street now and into the future. Starting in 2004, TriMet also moved new non-union employees into a defined contribution plan (similar to a 401k) which is also saving the agency resources that can be dedicated to more transit service. While headlines and interviews focus on the wages of a small group of employees, we’re focused on fixing our long-term cost structure. Fixing that allows us to focus on the real issue facing riders – restoring and expanding bus and MAX service. “That’s what riders are asking for every day and I am firmly committed to making this happen,” said McFarlane.